Belarusian history was full of events: endless wars, changes of the rulers, imposition of culture, religion and other difficult moments. But Belarus overlived those difficult times of its history. Now, it is an independent country that preserved its traditions and language. Below you can find a short history of Belarus. Foundations of the statehood in the Belarusian lands were laid back in the tenth century. The first centrally-managed formation on this territory was the Principality of Polotsk, founded by the krivichi. The importance of these lands is in the location on the famous trade route from the Varangians to the Greeks. The beginning of the development of this Principality was originally started by the Iziaslavichis (named after the grandson of Rogvoloda, the first Polotsk Prince Izyaslav). At the end of the century, a significant event took place, largely determining the fate of the Lands. It was the baptism of Polotsk by Torvald Kodransson. In the 11th century, the Principality continued to expand. Its territory covered a third of today's Belarus by the end of the century. This century has gone down in history by campaigns against Novgorod, as well as wars with Rurikovichis, which occurred because of establishing more strong relations with Scandinavia. The Saint Sophia Cathedral was built in Polotsk, which is still standing in its place. The following period was marked by a characteristic for European countries feudal fragmentation and constant wars between local Princes. As a result, the Polotsk State was divided into seven smaller principalities, and its power was lost. In the thirteenth century, the Grand Duchy of Lithuania with its capital in Novogrudok was formed (over time it was moved to Vilnius). The period from 1223 to the year 1291 came into history of Belarus as the anarchist period. Since in both principalities there was a constant battle for the throne due to the absence of direct heirs. Learn about famous Belarusians in the world history. Only Lithuanian Prince Gedimin, as a result, was able to peacefully unite the Polotsk and Lithuanian Principalities and thus put an end to the endless bickering. Thanks to him, and later to his son Olgerd, Belarusian lands were finally assembled in a single Grand Duchy of Lithuania. It was the period in history of Belarus when the Belarusians started to form as a nationality. Olgerd, defeating the Mongol-Tatar Horde, joined Kiev Princedom to their land, thus making their nation the largest in Europe. In the mid-fifteenth century, the Grand Duchy of Lithuania started its "golden age". State reaches its peak both in the territory and economy, the culture at this time is also on the rise. In the same century, the Litvins (todays Belarusians) eventually formed into a separate ethnic group. The following period was marked by the merger of a single State of the Grand Duchy of Lithuania and Kingdom of Poland and the creation of the Commonwealth with a view to joint defense from Moscow and other threats. The Brest Union was signed between them, which solved the problem of religious strife. The 17th century is one of the darkest in the history of Belarus. One war was followed by another. As a result of endless, exhausting struggle against Muscovy, Sweden, Ottoman Empire and the Zaporozhian host, the population of the State has been halved. The result of such turbulence was another territorial split, then the time of magnate anarchy started. Permanent civil war, the creation of Szlachta confederations (Szlachta was 10 percent of the population) has further weakened the Commonwealth. May 3, 1791, the first constitution of Europe was adopted, but it didn't save the state: 18th century ends by the split of States and the Kosciuszko uprising. Since the nineteenth century, Belarusian lands became a part of the Russian Empire and were named the North-Western region. On the eve of a possible war with Napoleon, in March 1810, a plan of defending the western regions of the Russian Empire from war was prepared. It included the erection of new defensive fortifications. The Bobruisk fortress was built, which played a significant role in the Patriotic War of 1812. In 1863 there was an uprising of the united gentry and peasantry of Belarus, Lithuania, Poland against the Empire, which entered the history of Belarus as the Kalinovski uprising. In this time, patriotic groups of students and activists were formed and conducted their activities. In the twentieth century, Belarus had even severe experiences. Two debilitating world wars, during which millions of inhabitants were killed, and dozens of towns and villages were destroyed (Minsk was almost completely destroyed). But, nevertheless, this is also the era of the collapse of the Russian Empire, which led to the formation of the Belarusian People's Republic, which was an important stage in preparation for the collapse of the Soviet Union and the creation of a new, independent Belarus. 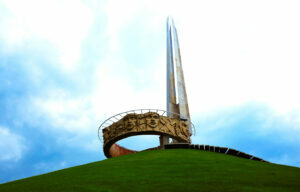 In 1990, the history of Belarus started anew, the Declaration on State Sovereignty of the Belorussian SSR was adopted. The following year it was given the status of a constitutional law, and on September 19, 1991, the BSSR was renamed into the "Republic of Belarus", the USSR finally ceased to exist. After the collapse of the Soviet Union and the acquisition of independence, Belarus became a parliamentary republic: the Belarusian ruble was introduced, the formation of its own armed forces began, and the Belarusian Greek Catholic Church was legalized. In 1994, the Constitution of the Republic of Belarus and the main legislation of the country were adopted, and the first presidential elections also took place. Today, you can touch the history of Belarus by visiting medieval castles and palaces. You can also find out more about the history of Belarus in general and the history of different cities separately, visiting numerous museums situated all over the country.